In resume, data gets streamed from ffmpeg through web sockets and is received frame by frame as Motion JPEG. Then we encoded the images as Base64, sent them over web sockets to the frontend and draw them to HTML. Actually this is the code to make it work on Linux (ubuntu 14.04 with ffmpeg 2.6), but I couldn’t make it run on Windows and really would appreciate any tips for that. 3. Open browser, type your IP and port like http://localhost:8080/client/ and you should see your video stream embedded into the website. This entry was posted on Monday, March 30th, 2015 at 12:44 am	and is filed under hacks, software. You can follow any responses to this entry through the RSS 2.0 feed. You can leave a response, or trackback from your own site. Hi there. Firstly thank you for the code above. I have got it working, but had an issue and wondered if you could help? I am executing an ffmpeg command as above, but when it is updating the canvas background on the client side, the video is choppy and inconsistent. I am not using a webcam / live video. My end goal is to run a filter_complex in ffmpeg, creating a new video with inserted images, and streaming that to the client as it’s being built. Do you know of any tips / examples that could help with this please? did you figure out how to make the video smooth? 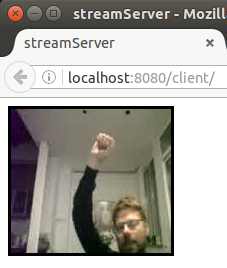 we are streaming live video via websockets and it is also jumpy and inconsistent. It seams better to draw the stream directly into the canvas instead of CSS background image. To do so, uncomment lines 33 to 41 and comment line 43.